But wait until you discover what’s under the sea (and our roof!) from 6-22 April. 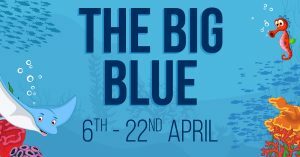 Our Big Blue event has more going on than you can shake a barnacle-covered stick at. Dive right in and discover a world of underwater wonder. We can’t promise you’ll meet the Easter Bunny, but our baby rays and retired salamanders are egg-cited to say hello! Not to mention our Freshwater Fun Zone, Tropical Treasures and Solent Seas Zones – filled with all sorts of eggs-ceedingly fun characters. That includes our friendly aquarium team, who’ll be giving talks and feeds throughout your day. So, if you’re worried about your little ones teeth after eating too much chocolate this Easter, come and see our reef sharks, who have more than 10 rows of teeth to think about! Or trot along to our seahorses, who have up to 1,000 babies. That’s a lot of Easter eggs to buy! From poison dart frogs to spiny starfish to otterly amazing mammals and amphibians, come and make some new friends. No eggs-cuses! SAVE an egg-stra 20% by buying your tickets online here.